Sprint charging for BlackBerry PlayBook tethering?! We just got a pretty interesting image sent to us via the CrackBerry tips line and quite honestly, it leaves us wanting some more details. 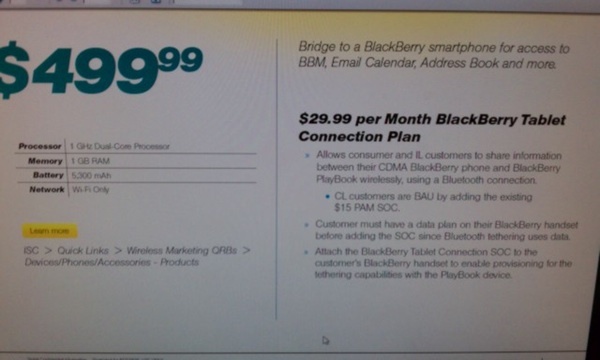 It's no secret that Sprint will be releasing their 4G enabled BlackBerry PlayBookthis summer but according to the info above it looks as though they'll also be selling the WiFi only version come April 19. That however, isn't really the biggest piece of news here. The real news is the info on the side that we can't really make out. But, looking closely at it -- it appears Sprint is looking to add a BlackBerry PlayBook specific plan for tethering your device. Details have been slim on how, exactly carriers were going to handle the tethering data and for the most part, we knew we'd see some carriers try to charge for it and unless we're missing something from the info here it looks as though Sprint is jumping on that ship. When it comes down to it, tethering on your PlayBook shouldn't be an extra charge -- it uses your already existing BlackBerry data plan so charging for tethering seems rather silly. 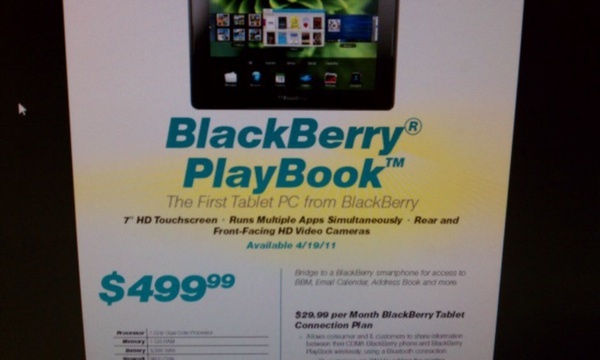 Granted, you do have to have a plan on most carriers if you wish to tether a computer from your BlackBerry but if their is a extra data plan associated to the cost of the PlayBook on top of what you already pay for your BlackBerry then carriers have just stripped the PlayBook of great selling feature. Of course, we're hesitant to say too much here since we can't see the full details based on this image but hopefully we'll have more details soon. Let this be a note to other carriers planning the same, not cool. Thanks, Gilligan793 for sending this in!